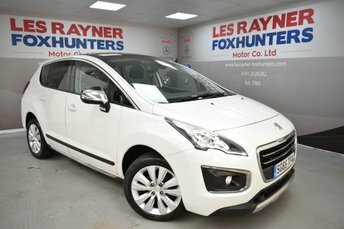 FV15YRY PEUGEOT 3008 1.6 HDI ACTIVE 5d 115 BHP - 14k miles! 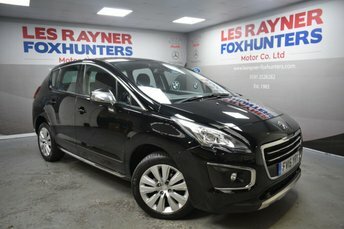 The 3008 looks great in black and boasts a spec of 17" alloy wheels, radio/cd/aux/usb, air conditioning,rear isofix, reverse sensors, cruise control, autolights and wipers, Bluetooth, electric windows and remote central locking. The 1.6HDi is extremely economical with Peugeot fuel consumption figures showing 64.2mpg extra urban and 60.1mpg combined. Superb value for money at this price! 2 keys supplied ! Looking to save money on a used Peugeot for sale in Whitley Bay? 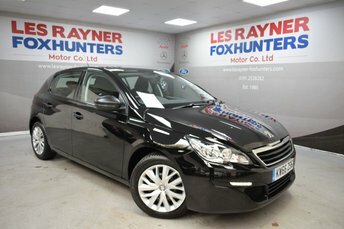 You can always be sure of finding a great deal when you come to Les Rayner Foxhunters Motor Company Ltd. We're proud to be one of the region's leading pre-owned vehicle specialists and with a huge range of quality vehicles to choose from, you're sure to find a second-hand Peugeot that fits your requirements. If you're looking to save on a used Peugeot 206, or want to enjoy the thrill of a used Peugeot RCZ, be sure to speak to a member of our team. Call, get in touch here on the website or pay a visit to the showroom in person.